I've been needing a new full apron, so I decided to tweak this week's Zakka project to fit the bill. My design was completely improvised, but it seems to work. The top of the apron is a Happy Go Lucky print, the skirt is from Lori Holt's darling Bake Sale collection, and the sash is a large dot fabric from Oh, Deer that I've been saving for a while. I love to pull prints from different collections and watch them play together! I just made one block for a small pocket, but it was so fun to sew. It seems like every one of the projects in this book is absolutely perfect for fussy cutting. I always say that quilters are some of the nicest people in the world, and you all just reminded me again why I say it. Your sweet comments and emails after my post on Friday were such an encouragement to me. I can't tell you how much I appreciate it. Things are looking up. The car is fixed and the internet is working again, both of which go a long way toward making life a whole lot easier. I'm even in the middle of a quilt top using my blogger bundle, and I can't wait to share it with you next week. Mostly I'm reminded how much I have to be grateful for, and that definitely includes all of you. We may be long distance, online, possibly-never-going-to-actually-meet-in-person friends, but I'm so thankful for your friendship just the same. Well, I'll tell you...it's been quite the week around here. Our internet service has been dying a slow death, which is why the blog has been a bit more quiet than usual. Every time the internet is working, I'm in the middle of something, and every time I'm ready to post, it's down. A new internet router is supposedly coming to our rescue and should be arriving by mail tomorrow. Unfortunately the old router and our car's transmission seem to have made a suicide pact when we weren't looking, so we're taking our minivan in for what will in all likelihood be the most expensive auto service appointment in history tomorrow morning. Perhaps all this explains why I suddenly wanted to burst into happy tears when I found this package in my mailbox today. This is my California Road Trip blogger bundle that I put together for Jennifer at Tactile Fabrics, and I have to say, it looks even better in person than it did on the computer screen. 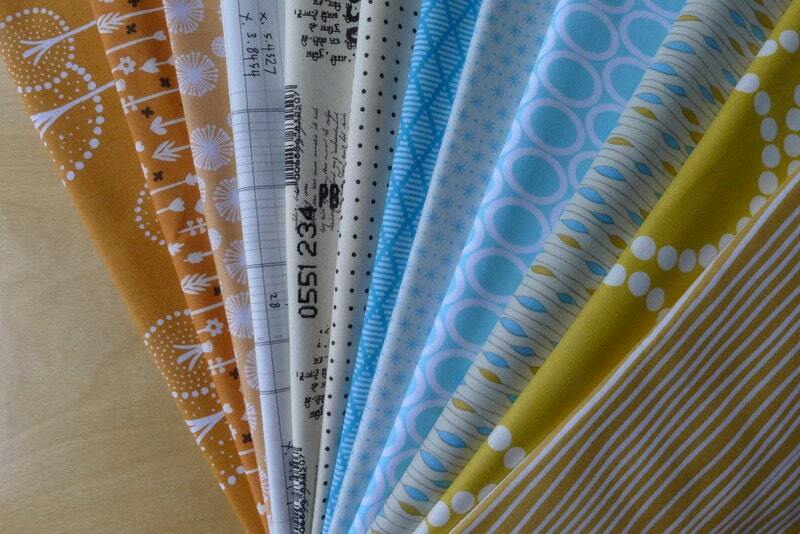 I can hardly wait to start cutting out pieces for a summer quilt from this happy little stack of fabrics. It looks like the bundles are definitely selling, so head over to Jennifer's shop if you want to grab one for yourself before they're gone. You can get a fat eighth bundle for as little as $16.25, which should still (hopefully) be in even my price range after we get tomorrow's repair bill from the auto shop. I also wanted to show you this wristlet that I made on Sunday night for a friend of mine. I used a navy print from Bonnie and Camille's Happy Go Lucky line, definitely one of my favorite fabric collections of the past year. My friend and her husband love to travel -- in fact, he just finished leading a tour group through historical European sites relating to the Reformation -- so I tucked a little travel journal inside just for fun. My dad and I were commiserating over the dinner table this evening about the unending parade of disasters we've had this week -- did I mention that his recliner broke beyond repair last night? seriously -- and I couldn't believe the list as I ticked off everything that had died over the past seven days. My dad just shook his head, "Ah, the week of death..." Then he grinned, "Well, as long as none of us dies, I think we're doing okay." I'm thrilled to announce that my blogger bundle is now up for sale at Tactile Fabrics on Etsy! Jennifer was kind enough to let me have some fun with the wonderful modern prints she has to offer in her shop, and I absolutely love the result. California Road Trip is a fabric stack that reminds me of many a trip I've taken on Pacific Coast Highway, my home state's famous Route 1. I chose a palette of aqua, yellow, orange, cream, and white -- with a few text prints in there too (you know I couldn't resist!). It's everything that reminds me of summer, and I can't wait to get one of these bundles myself to start working on a picnic quilt to use with the kids. 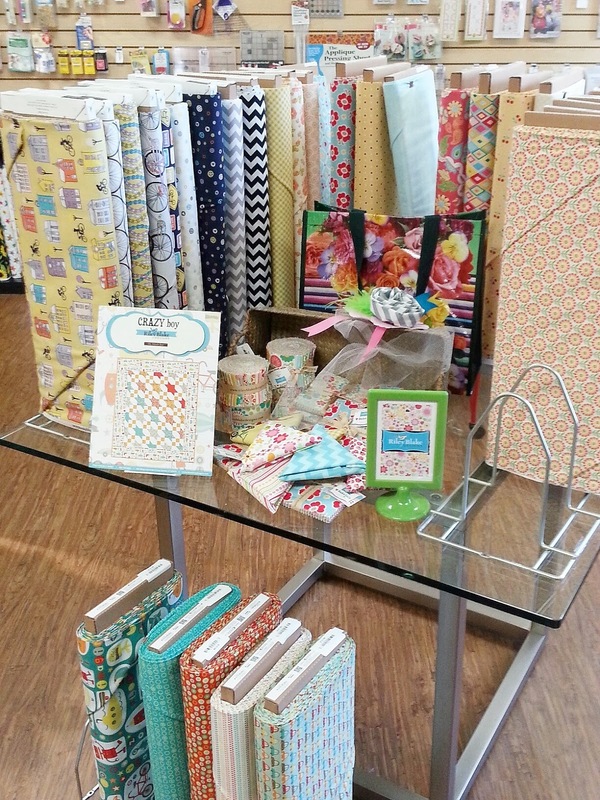 You can buy either a fat quarter or fat eighth set, depending on where your fabric budget is this month. If you make anything with this stack, please do share pictures with me. I hope you enjoy it! I ran out of time for last week's Zakka project, but I'm back on schedule with today's adorable tea cozy set. Picking out the fabrics always takes the most time, but what fun it all is! I switched the order of "tea" and the teacup only because I liked the colors better this way. I've been saving some of these prints for a while, and it's great to finally see them in use. I absolutely love this teabag caddy. Such a simple but incredibly useful project. Wouldn't a larger version of this be perfect for holding note cards? I used a hair elastic instead of string, and the button is from a set that I purchased on Etsy from RetroNaNa. She has an incredible selection of buttons on there if you have time to take a peek. And don't forget that this is week 3 of the Let's Get Acquainted New Blogger Blog Hop. Stop by Plum and June to see all the great bloggers who are sharing with us today! Linking up with the Zakka Along and the Let's Get Acquainted Monday Linkup. As I've said before, there are virtually no modern quilt shops within a reasonable driving distance of my home. While I love the convenience and service I get at all my favorite online fabric shops, there's nothing like being able to hold that bolt of cloth in your hands and the see the prints with your own eyes. That's why I was absolutely ecstatic when I got an email yesterday saying that The Quilt Loft had just opened in Upland, CA -- not twenty minutes away from my home. And look at the happy stack I brought back with me after a visit! Keri, the owner, used to work at a local quilt shop, and she noticed that a lot of customers were asking to see more modern fabric collections in stock. She's hoping to provide contemporary lines in her shop along with traditional options as well. I spotted a calendar at the register that announced a few classes starting up, and she also has a long arm machine where she offers quilting services. I snapped a few pictures inside with my cell phone so you could get a glimpse of the shop. It was a thrill to get the chance to see some recent collections and familiar designers -- Lori Holt, Julia Rothman, Kate Spain, and Jeni Baker, to name a few. There were also spools of Aurifil thread and plenty of modern patterns on display. If you live anywhere nearby, I encourage you to come support this little shop. And when you come, be sure to say hi. I'll be the one with my arms full of fabric. Linking up to the Sunday Stash. ...and typewriters on the back. Linking up with Needle & Thread Thursday and Finish It Up Friday. This little baby quilt was an absolute dream to make. The pattern is simple to piece and quick to sew. I love the modern feel it has, even with the children's prints. You'll recognize my Bells & Whistles fabric audition from the other day with a few changes. I almost never finish a project using exactly the same fabrics I pull at the start. About half of these fabrics are organic, and I really appreciate the slightly muted colors which, for me anyway, also adds to the modern vibe. I enjoyed using the mix of low volume prints along with Kona white for the background. The binding is a typewriter key print from Type by Julia Rothman -- a fun take on an alphabet print -- and the backing is the yellow print in the center block which I picked up at the local Hobby Lobby. It was in the clearance section at a great price, and I just couldn't refuse. My sister loved the Fandango so much that I made her a table runner and place mats about a month later out of the leftovers. Believe it or not, I still have a bit of this collection in my fabric closet which I'm saving for a rainy day. I fell hard for Good Fortune when it was released, and I was so excited to use most of two charm packs to make a lap quilt for a friend of mine who is originally from China. For Bunny's birthday that February, I made some little pillows and felt characters as favors for her Alice in Wonderland party. The rest of the charm squares were perfect for these, and while the felt characters bit the dust soon afterward, those pillows are still going strong! My very first tutorial was my Abacus Baby Quilt which I made with charm squares of Central Park that I got from a friend. My girls use this quilt often for tea parties with their dolls. The most recent project I've made with Kate Spain fabrics is my Watercolor mini quilt, and it is definitely my favorite of all the ones you see here. This quilt hangs on the wall in my daughters' playroom, which used to be one of their bedrooms before they all moved into one room together. I've spent many a night looking up at this quilt while rocking a little one to sleep, and we've kept good company together. Perhaps that's part of the allure of Kate Spain's fabrics too: there's a friendliness in all of her collections that's so very hard to resist. Be sure to visit the blog hop page here for the rest of the schedule, and so many thanks to my friend Alyce for letting me join in the fun! I'm getting ready to make a baby quilt next week for an old friend of mine who's expecting a little boy. This week's fabric audition is my preliminary fabric pull. I may add a few more prints to this, but so far it's working for me. The colors are happy and the prints are very child friendly -- just what a baby quilt ought to be. "Bells & Whistles," I thought suddenly as I was thumbing through these fabrics, and the name stuck. I love making baby quilts, and I can't wait to start working on this one. By the way, there's a very good chance that one of my fabric auditions will be hitting the big time soon (i.e. you will actually be able to purchase one for yourself if you like what you see). I'm more than a little excited and will be quite happy to give you all the details when I have them. I have several wonderful friends on the list above, and I know that every one of these ladies has great things to share with you. Be sure to stop by and leave them some encouragement in the comment box! Today I'm guest posting over at Jennie and Clara's blog Clover & Violet, one of my favorite places to visit in the online quilting community. I always feel so at home there among the stories of family life and happy sewing. Jennie was kind enough to invite me to be a part of their wonderful summer series, A Season By Hand, and I'm so pleased to share with you my latest finish -- Plain & Fancy -- and a little bit about my ongoing friendship with hexagons. Come take a look! Linking up to the Modern Mini Quilt Challenge and Finish It Up Friday. I was thinking this morning about books, sewing books to be specific. There's so much information available online these days -- free tutorials, patterns, blogs, etc. -- yet I can't escape the allure of holding a book in my two hands and paging through the pictures. 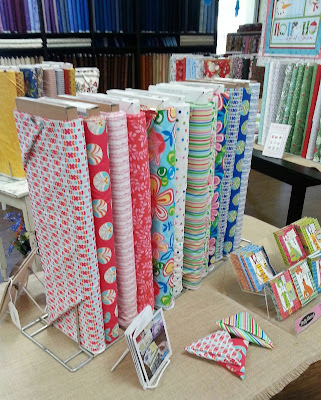 Do you buy sewing books and magazines? And if so, what are you looking for in there that makes it worth the money? I'd love to hear your thoughts on this subject, so please share! How sweet it is to be back on the Zakka Along again. Last year's trip through Zakka Style by Rashida Coleman-Hale was a life changing experience for me. I think I tripled my skill set by the end of that sew along, and I wasn't even able to do every project in the book. I, along with the rest of blogland, have been eagerly awaiting this next round and the chance to work through the projects in Ayumi's incredible book Patchwork, Please! I followed Penny's advice and turned my bell pepper coasters into hot pads. Mine are a little smaller because our aging home office copier only goes up to an enlargement setting of 141%, and I just didn't have time to go make copies somewhere else. These still work quite nicely, and I'm sorely tempted to make more. Choosing the fabrics was, as usual, my favorite part. I love working in those text prints wherever I can. Fresh cherry tomatoes from the garden and bell pepper hot pads: a match made in heaven. Linking up to the Zakka Along 2.0 and the Let's Get Acquainted Monday Link-up. 1. Know who you are. In business, they call this "branding yourself," and if you run this phrase through a search engine, you can find lots of good advice on the subject. The main idea is that you need to have a clear idea of what you want your blog to be and how you're going to stand out from the crowd. When you're just starting out, I think it's a great idea to look at the blogs you love most and figure out what makes them so attractive to you. A lot of those ideas can be easily adapted into your blog and repackaged with your own sense of style. I Spy quilt made with charm squares from my first fabric swap through Ellison Lane Quilts. The piecing isn't perfect, but I had finally discovered how to make my own binding. Bear soon adopted it as her special bedtime lovey quilt, and I have to admit, I still love this one! 2. Make it a personal space. It can be difficult at times to walk the line between too much and too little information. A blog with no personal details at all can seem a bit cold, which makes it hard for you to relate to the writer. On the other hand, if you're running a sewing blog, almost every post really ought to relate to sewing in one way or another. There's a balance in there somewhere, and only you know exactly where it's going to be. Part of that balance will also involve your family's privacy. Everyone has a different take on this question, and the answer is completely up to you. I made the decision way back at the start that I was not going to ever include my daughters' names or faces in this online space. While I could never write a blog without mentioning my Bunny, Bear, or Mouse, I want to let their personal identity be theirs to keep for now. This was the first time I had ever made my own purse and wallet. I had been terrified to try making bags and pouches before I started last year's Zakka Along, but now they're one of my very favorite projects to sew. Do I include a good mix of pictures and text? Are my pictures well-lit (preferably using natural light), appealing, and in focus? Are my grammar and spelling correct? Is my blog header clear and in focus? Do I include information about myself and ways to get in touch with me through email or social media? Do each of my blog posts have a point or am I rambling too much? These may seem like obvious questions, but it's really worth your time to follow up on them. Simple things like this can make all the difference between whether a visitor stays to look around or clicks the back button. You also need to consider how often you're posting. No one expects you to post every day -- though there are some amazing bloggers who do -- but I think it's helpful if you can post at least once or twice a week. It's easy to lose touch with your readers when you're only posting a few times each month. Remember also that you don't need to have a finished project to show off before you have permission to write a blog post. Progress photos, fabric stacks, sewing gatherings, tutorials, new tools or gadgets, and sewing books all make wonderful topics too! Last year I discovered paper piecing and pillow making, and I was hooked. This may possibly be my favorite pillow yet, but it's got plenty of competition after all the ones I made this winter. Did I mention that I just bought the book Pillow Pop? Join Flickr. It's free, and it will give you the chance to join groups of people who are sewing the same kinds of things you like to sew. Join a blog link up at least once a month. If you join nothing else, do the Small Blog Meet at Lily's Quilts which Lynne holds on the first day of each month and the Let's Get Acquainted Monday Link up at Plum and June. That was the launch pad for my blog, and I can't recommend it highly enough. If you can link up more often, there are events for almost every day of the week. You can find a list right here. On a side note -- don't let that certain party link-up day become a looming deadline that hangs over you every week. If you don't finish a project in time, it's not the end of the world. Comment and respond to comments. This is huge, and yet so many people don't do it. If you want to connect with others, you've got to start talking to them, and when they talk to you, you've got to talk back. It's good business, good manners, and good encouragement for everyone involved when you take the time to comment and respond with other bloggers who have taken the time to hear what you have to say on your blog. You'll be surprised at the friendships that come to you along the way. If I hadn't seen it with my own eyes, I don't think I would have believed that I could make an improv quilt. Both my Heather Ross quilts will always be special to me for so many reasons. 5. Be yourself. Everyone says this, but I think we forget what it means. It doesn't mean that you have to be just like that popular blogger you adore who's so clever/hilarious/creative/inspiring/fill-in-your-word-here. It doesn't mean that you have to be absolutely crazy about the latest sew along or modern fabric line because everyone else is jumping on the bandwagon -- though if you are, feel free to stand up and cheer. It means that whoever you are and whatever you like, share that with us. If you love 1930's flour sack prints, why hide it? If you want to make a Civil War quilt out of modern fabric, don't ignore the urge just because you think it's not the modern quilting thing to do. And if you have a passion for solids instead of prints, bring it on! You don't have to fit or break the mold, and you have nothing to prove to anyone except yourself. If you love what you're doing, it will come across loud and clear to all of us out here. And even if we don't all share the same style, we can certainly relate to the joy behind it. So be yourself. We'll love you for it. The last time we spent a vacation in a hotel, I was pregnant with Mouse, Bunny was a hyper preschooler, and Bear still had to be carried around everywhere. In fact, the entire memory is one intense blur of exhaustion...so much so that I was a little hesitant about trying that sort of thing again. A few months ago, though, we decided to take the plunge and schedule a mini vacation of two nights in Carlsbad during this first week of June so that we could take the girls to Legoland. I'm happy to say that it was a great experience all around. 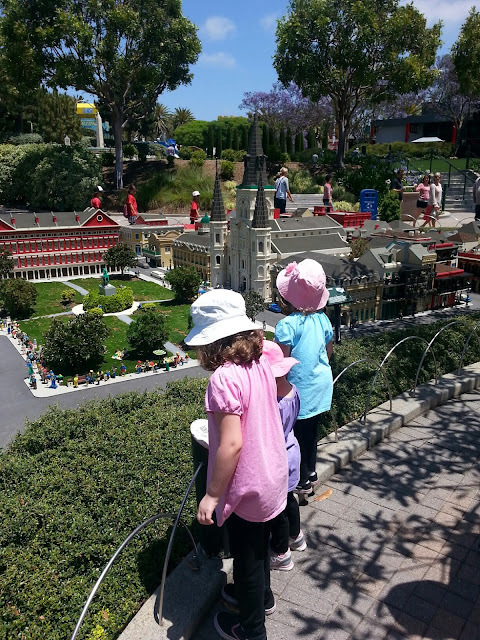 My girls (ages 2, 4, and 6) are exactly the right age for this park. Bunny and Bear could do almost everything in there, and Mouse was happy enough to watch what she couldn't do. 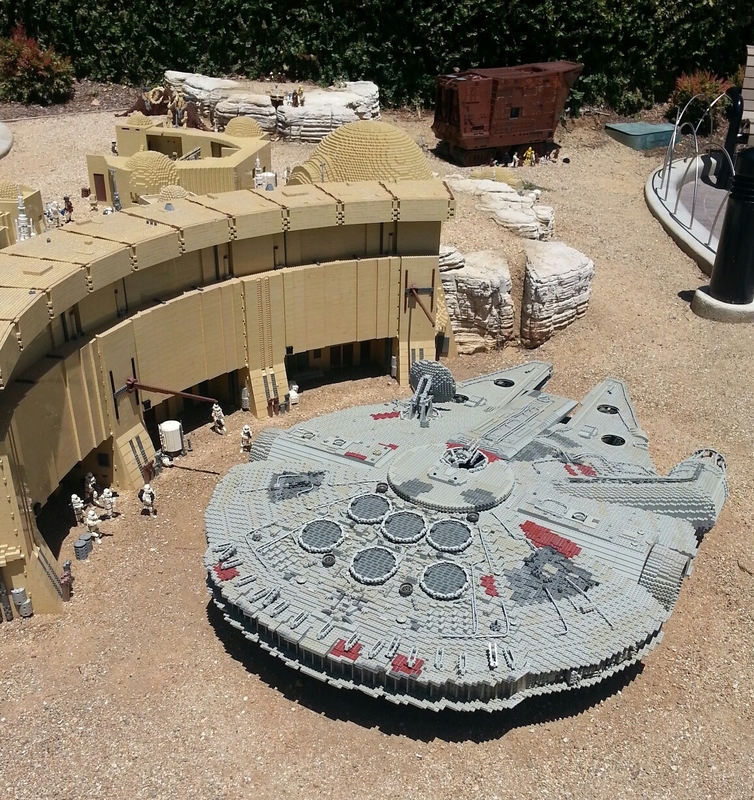 Though it's not quite up to the production level of Disneyland -- and honestly, what else is? -- it's a great place to take kids who are 10 and under. 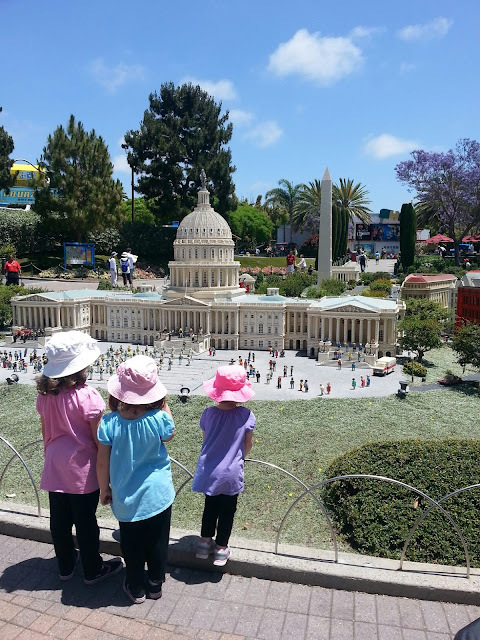 Having been obsessed with Legos myself as a child, I was particularly fond of the Miniland U.S.A. section in the center of the park which features sculptures of various cities across the country. And as a former Star Wars nerd back in my teenage days -- the original trilogy only though, mind you -- I was just a little excited about the movie sculptures in the park as well. I didn't get photos of everything, but if you want to see more, the L.A. Times has a great photo gallery here. So really there wasn't much time left over for sewing this week. However I do have a quick project from a short while back, a pouch that I made as a gift for Carla who writes the lovely blog Grace and Favour. I absolutely love the projects that she has in progress right now, particularly her alphabet hexagons and Green Tea & Sweet Beans quilt. You should definitely stop by for a look. The pouch is covered in some of my favorite scraps, paired with yarn dyed essex linen in leather, and lined in one of Denyse Schmidt's latest prints from her new Blossom Reel collection. I had so much fun putting this piece together. I'll be back on Saturday with a special guest advice post to help kick off the Let's Get Acquainted New Blogger Blog Hop. See you then! One of my husband's coworkers has a daughter who is turning one this week, so my husband asked if I could make something that we could bring as a birthday gift to the party on Saturday. I've been just itching to use the Mr. Bear print from Sarah Jane's new Let's Pretend collection, and this was my chance. May I present the Mr. Bear Kit. Mr. Bear is made exactly like Mopsy, Bunny's tooth pillow which I shared with you last month. I love making these little stuffed friends. They're so quick and easy to put together, and they're the perfect size for small hands to snuggle. I sewed a little pillow and quilt for him along with a bag to hold it all. It was so much fun putting this kit together in the sewing room today. I love including a handmade bag or pouch with a gift. It's great to have a place to store the toys inside, and kids love carrying things around with them everywhere they go. My daughters do it constantly. I hope this little guy will be a good friend to the birthday girl.